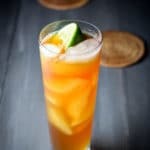 This exotic delicious Dark and Stormy recipe is super fun to make and oh so tasty to drink!! Oh, and did I mention it’s beautiful to look at? But I kind of botched it. Truly, it isn’t. If you’ve ever had ginger beer before, then you know what I mean. If you haven’t and you do a side by side taste test, you’ll see that ginger ale is mild and ginger beer is strong. And my patron? Well, he drank the one I made him, but he didn’t order another one! So few ingredients in this drinkie-poo! 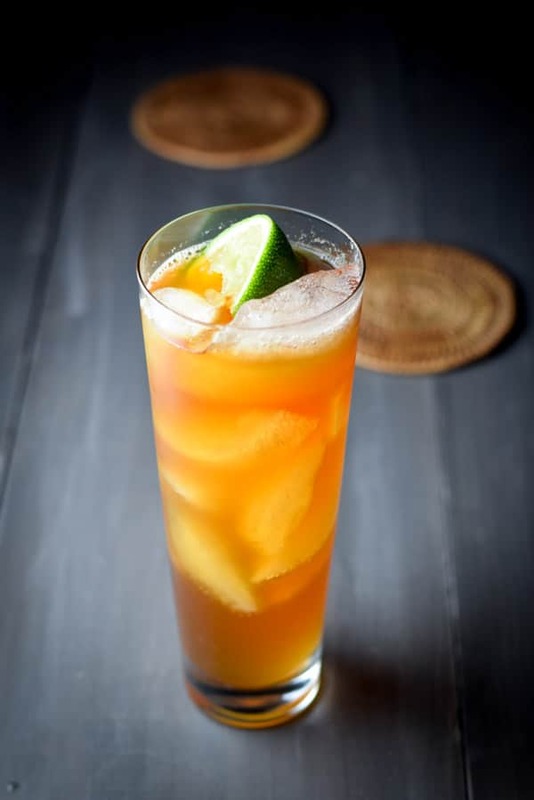 Dark rum, ginger beer and lime juice. That is it! Super easy. This is a cocktails that I mix directly in the glass. I grab one of my tall ones. I choose this one because it is really pretty. I like the way it flares. 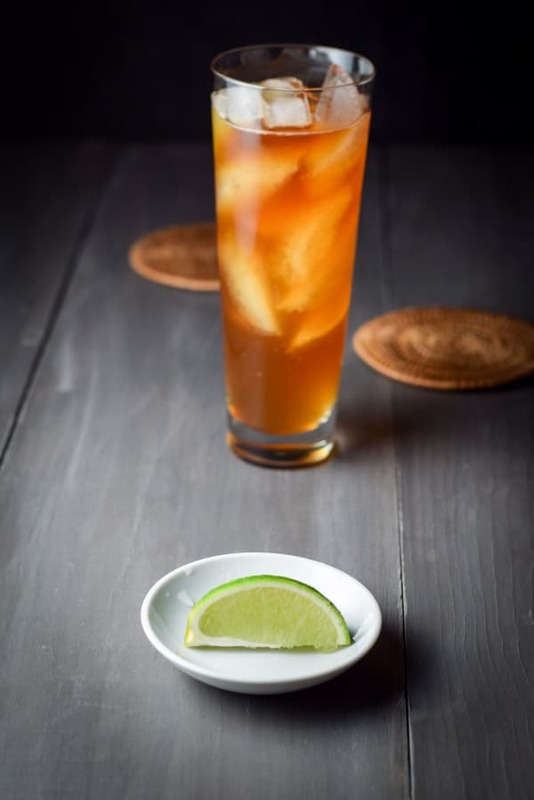 I have also seen Dark and Stormys in highball glasses but I didn’t want to make mine in a highball glass because I like more ginger beer than what that glass would hold. I fill it 3/4 full with ice cubes. I’ll probably end up adding more but that’s what I start with. I pour out 2 ounces of rum. 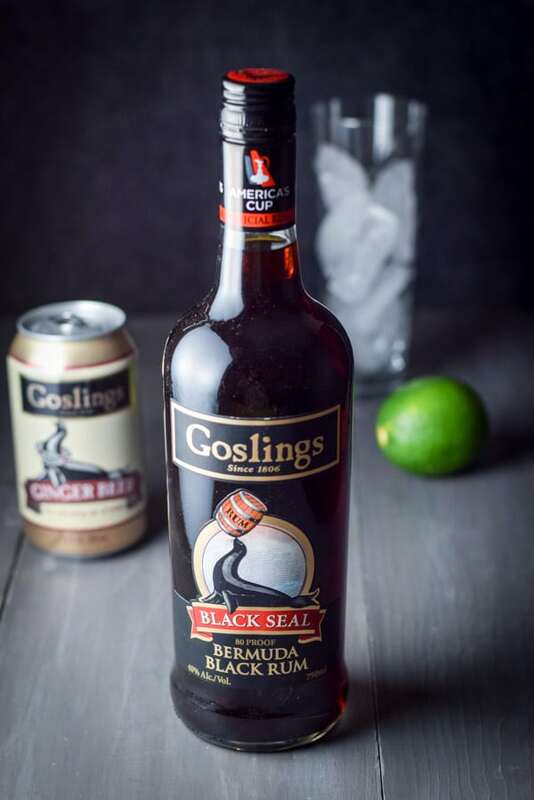 I’m using Goslings Black Seal Bermuda Black Rum. The reason? Well, Goslings created this drink and has a certified patent filed at the patent and trademark office, it’s naturally my first choice! I use more rum than Goslings’ certified recipe because I think my D&S needs the extra half ounce given the size of my glass. 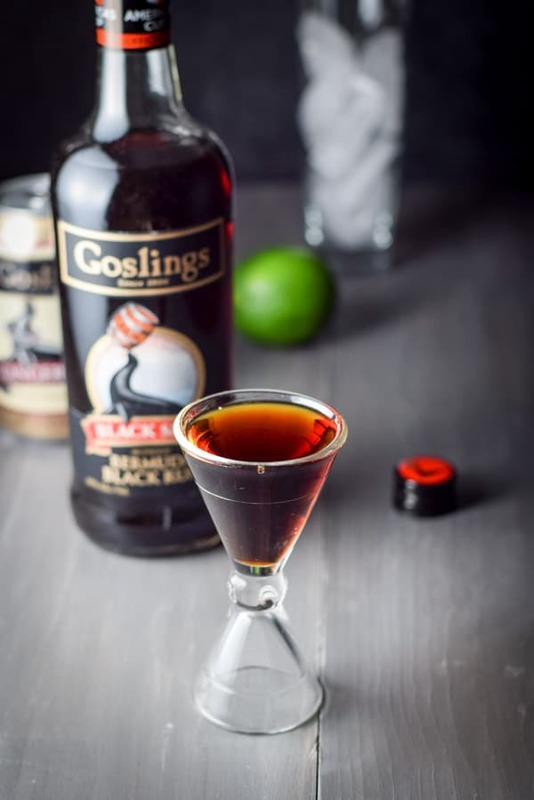 Goslings is a delicious rum!! I pour it into the glass over the ice. Next up is the ginger beer. I pop open the tab and measure 4 ounces of this fizzy ginger goodness. Into the glass it goes!! After I pour in the beer, I notice that the cocktail did indeed need more ice cubes, so I plop a few more in. Now, I grab the lime and cut a wedge that equals a quarter of the lime. I pick up the lime, squeeze the juice into the glass and plop the lime into it as well. The original recipe instructs you to take the lime and only rub it around the rim of the glass, but not to squeeze it into the contents. But I need more lime in my Dark and Stormy cocktail. Now all that’s left is to stir it up a little bit and drink this yummy cocktail. And a behind the scenes look of my photo set-up! Please feel free to leave me a comment and Pin any photo to Pinterest and Yum the recipe to Yummly! 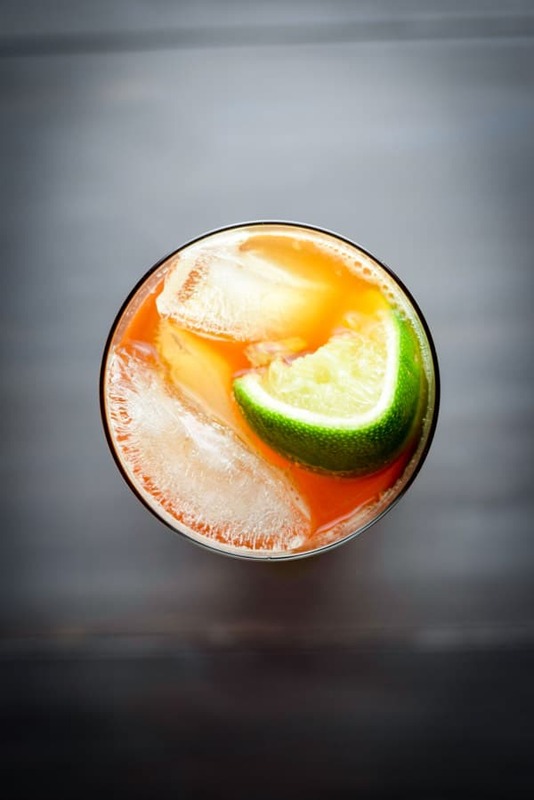 This beautiful drink is both delicious and easy to make. Only 3 ingredients! love the photos of this cocktail! 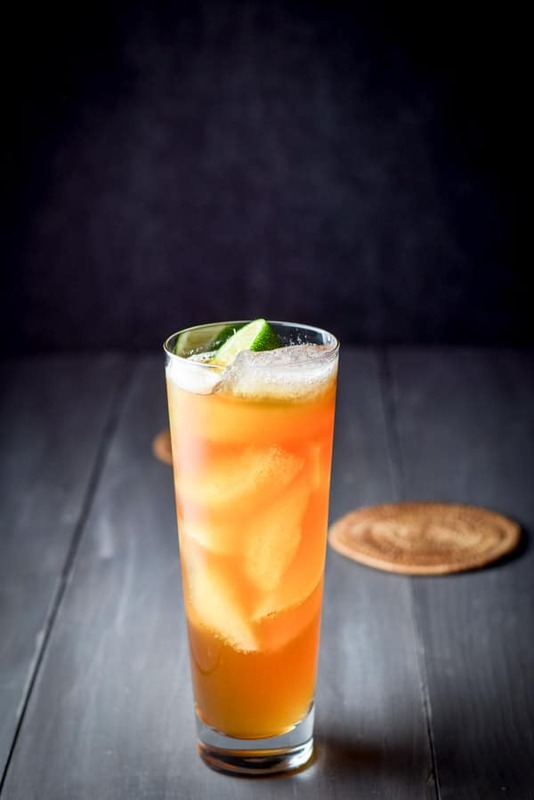 ginger is one of my favourite spices – both in baking and in drinks so I would definitely love this cocktail! My husband made this last night and enjoyed it! Thanks for the recipe!